By Chris Williams: Bob Arum of Top Rank has selected a proven ticket seller in 33-year-old Jorge Arce (61-6-2, 46 KO’s) to be the next opponent – read: victim – for WBO super bantamweight champion Nonito Donaire (30-1, 19 KO’s) to destroy on December 15th at the Toyota Center, in Houston, Texas. Arce is popular among Mexican boxing fans for all of his accomplishments in the past 15 years of his 16 year pro career. Arce has won world titles in four divisions, which unfortunately is becoming easier and easier for fighters to do given all the various title straps available to fighters nowadays. It’s not like there’s only one champion per division, because if that was the case Arce would be lucky to win more than one title. But whatever he once was he’s starting to show serious signs of slipping and he doesn’t belong at super bantamweight. 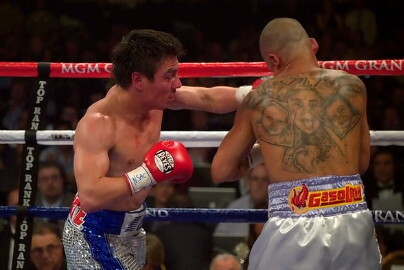 Arce is too small for this division, and he’s going to be battered by Donaire on December 15th. They’re trying to market the fight like it’s going to be a competitive fight because they obviously want to sell tickets for the fight. There’s nothing wrong with that. The Toyota Center has a seating capacity of 19,000, and that’s a lot of tickets to sell in Texas. All of the tickets will have to be bought by Arce’s fans because I can’t see Donaire having too many fans in Texas, because there’s not a large Filipino fan base there, and that’s where many of Donaire’s fans derive from. But this fight isn’t going to be competitive because Donaire has all the advantages. Arce is just another aging fighter that really should be fighting flyweight instead of super bantamweight. You understand the reasons for him moving up, because the better money is at super bantamweight, but he just doesn’t belong at this weight, especially at his age. He’s not old at 33, but he is because he’s had a lot of tough fights and he’s not a young 33-year-old.